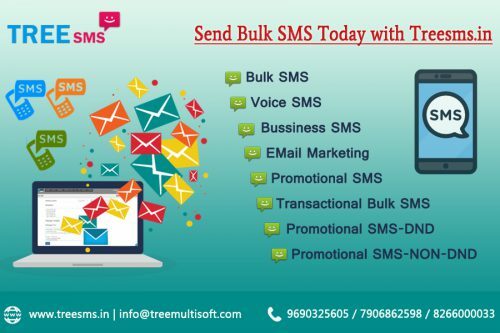 Short Startup Description: Tree SMS is the leading Bulk SMS service provider in India. We provide Promotional and Transactional Bulk SMS with effective https API and faster SMS Gateway network. As being the most popular Bulk SMS service provider company in India, our pricing is affordable and services are quality effective. We provide two types of Bulk SMS services in India, one is Transactional Bulk SMS and other is Promotional Bulk SMS. According to TRAI guidelines, you can send Transactional message to DND or NON-DND both numbers with no time restrictions and in Promotional SMS you can promote our services using the message to only NON-DND numbers from 9 am to 9 pm only. There is no setup cost of the Bulk SMS software and 24/7 customer care service is available with the effective HTTP API and Gateway network. The SMS software automatically filters your contact for Promotional and Transactional use. Any large, medium or small organization, entrepreneur and others can use Bulk SMS service.